Ok, so my last post was a little emotional but it's something I've been wanting to get off my mind, (and out of my blog drafts) for months. I hope none of you took it offensively- I just believe this community is worth much more than an uncredited photo and I get all Rosie Riveter about a subject. One thing I didn't mention in my post is how grateful I am for this blog. This blog has been the motherboard to so many connections. My best friends are across the screen, and just like the Format once sang, the need to fit in is harder when living life from a screen, I believed it at one point. Now, I can't imagine my days not skyping my best friends across the world, using Twitter as a form of communication, and of course, blogging. Blogging has helped me dig out a voice hidden, opened me up to wonderful people and here's to 2010! 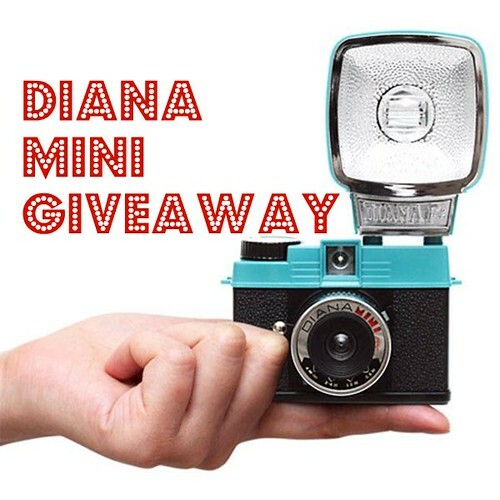 Ok, now the giveaway part: It's a Diana Mini with 3 rolls of film to get you started. My original blog posts were all about Lomography and it's what brought me to begin blogging in the first place. Fitting. 2. You not only have a chance to be a winner but you have a chance to do your part in humanity. If you donated to Haiti rescue funds, let me know how in the comments below (this is a blog of trust), and I'll enter your name twice. Not sure where to send money to? Here's a great list, thanks to twitter! You may tweet it (with the Share button below), you may blog about it, but let me know if you did it in this post to keep track of your name. You are welcome to grab the blog button on the side, tell your friends. This is a celebration and all are invited to the party! January is my BLOG birthday month :) I know, I'm a nerd for even bringing attention to it.